At Commodore Inn The Grove, our goal is to surround you with maximum comfort, top-quality furnishings and finishes, and unsurpassed service. That's what makes our turnkey apartment options so unique. We transform temporary housing into your home. Call or email us today to experience the difference. Our relocation corporate apartments are complete with a state-of-the-art kitchen, phone, cable TV, and more, our spacious suites have all the amenities needed to keep you comfortable so you feel at home. Located in the heart of the Grove, Commodore Inn The Grove is near many attractions in the neighborhood. Whether you are in a business trip, temporarily relocating or just taking an extended vacation, explore Coconut Grove. The thrill awaits right outside your doorstep. For its many options and privileged location, Commodore Inn The Grove in Miami, Florida, is the primary choice for extended-stay housing. Located in the heart of Coconut Grove, we offer temporary and corporate short-term apartments in a cozy, homey environment you'll love. Length of stay is anywhere from 15 days all the way up to a year. 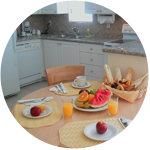 Our apartments are the perfect solution, make a relocation feel like a vacation. 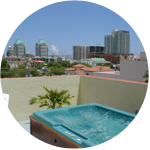 Give us a call, and you'll see why we are recommended on TripAdvisor™ for specialty lodging in Miami since 2010. 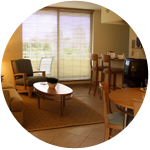 Book your stay in one of our short-term apartments and enjoy all that Miami has to offer. Contact us to begin the rental process.